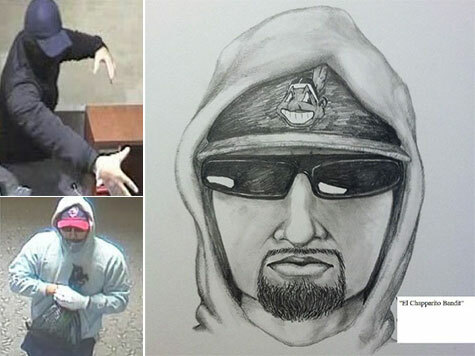 Suspected of robbing at least 15 banks in the past year, a man dubbed the “El Chapparito Bandit” is being sought by federal and local authorities who released a sketch of the thief on Tuesday and are offering $20,000 for information leading to his arrest and conviction. A San Diego Police Department sketch artist produced an image based on witness testimony and security images of El Chapparito. That sketch was recently released in seeking public assistance to track down the serial bank robber. Witnesses describe the bandit as a Hispanic or Asian male in his mid-20s at a height of 5’3″ to 5’7″ and a skinny build. His hair is described as dark, and he may be seen wearing a blue baseball cap, blue bandana-style mask, sunglasses, yellow gloves, blue jeans, or dark shoes. El Chapparito is believed to be responsible for at least 15 bank robberies in and around the greater San Diego area since November of 2013. He was most active in January and August of this year and most recently is suspected of a September 13 robbery of a Wells Fargo bank at the north end of the city of San Diego. In the September 13 robbery, the man suspected to be the El Chapparito Bandit entered the bank building, simulating a weapon under his shirt and yelling, “Hands up everyone.” The Federal Bureau of Investigation describes robberies committed by the bandit as modified takeover-style robberies. Typically, he enters yelling for everyone to put hands up or get on the floor, robs tellers, and simulates possession of a weapon with hand gestures.